Welcome to the Bross Hotel Bed & Breakfast! 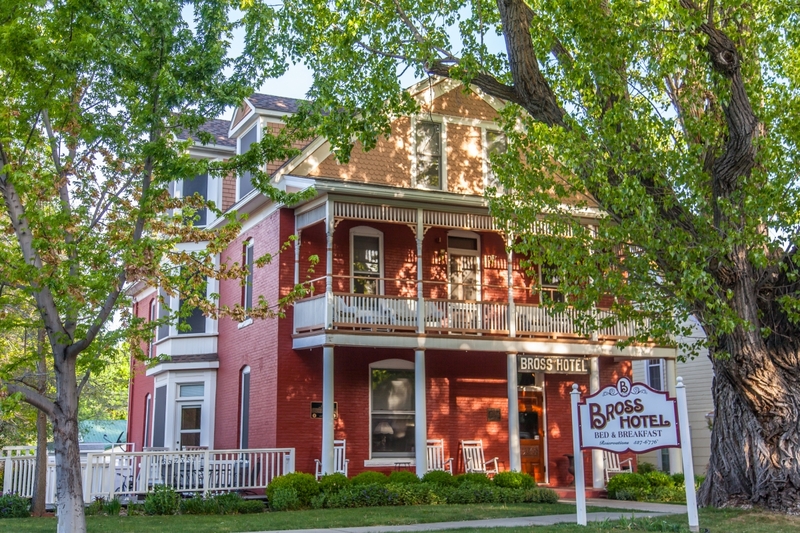 The Bross Hotel Bed & Breakfast is a beautiful 112-year old historic lodging place on the western slope of Colorado. Its graceful late Victorian lines and Western-style balcony are eye-catching to say the least, while the rocking chairs on the front porch invite guests to sit back to relax and enjoy the shade of the large cottonwood trees in the front yard. Upon entering the hotel, you are immediately wrapped in the warm, welcoming comfort of an earlier era. 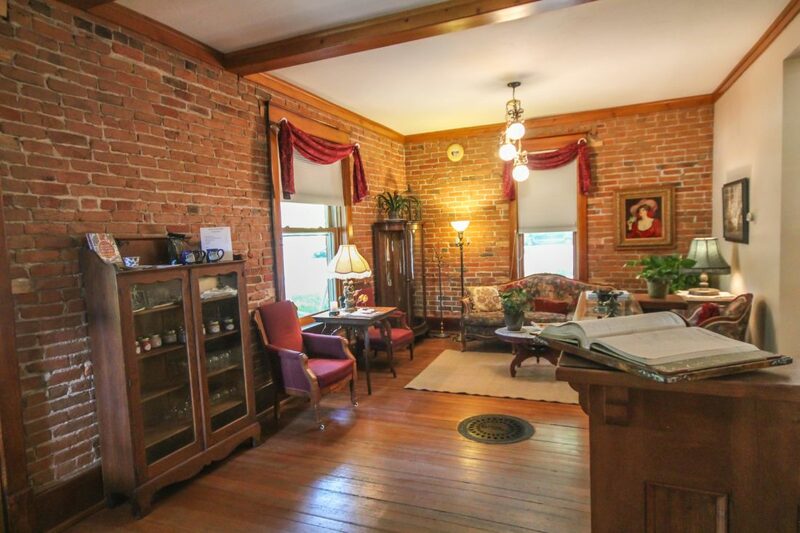 The entry room is furnished with period antiques and you are greeted by the new owners, Kevin & Karen Kropp. The Kropp’s are local organic fruit growers in the Paonia area and are excited to carry the fruit theme with them to the hotel. The newly decorated rooms will give you a taste of the areas local flavor. 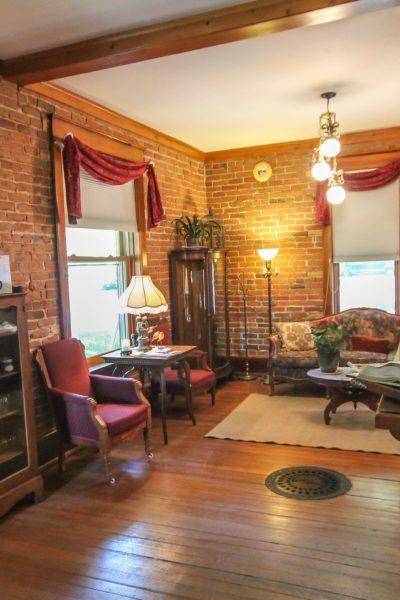 Behind the living room, you’ll glimpse the “Garden Room” with its bay window and elegant antique back bar upon where the delicious breakfast buffet is served. When you proceed upstairs, you’ll find that the ten rooms, all with private baths, are uniquely decorated with fine egyptian cotton linens, luxurious bedding and a delicious fruit theme of your choosing. You have escaped to another time, but you can still enjoy the luxury of twenty-first century amenities like Wi-Fi. Paonia is a small town in the North Fork Valley on the western slope of the Rocky Mountains – but it is rich in attractions and activities. 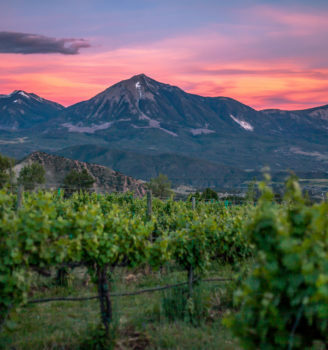 Known for its orchards, organic farms and the many beautiful vineyards, Paonia is Colorado’s farm-to-table capitol. The restaurants use local produce and everyone celebrates the bounty of the area at the Cherry Days (July 4th), the live concerts in the Town Park (Thursday nights throughout August), and Mountain Harvest (late September) Festivals. 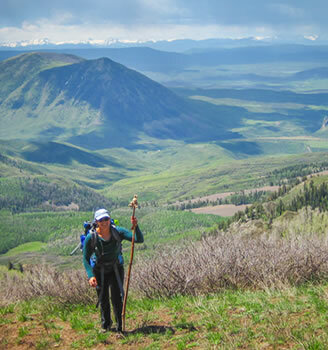 Federal lands surrounding Paonia provide boundless opportunities for outdoor activities and endless possibilities for day trips. The inspiring beauty of the valley attracts artists and musicians to make their homes here. 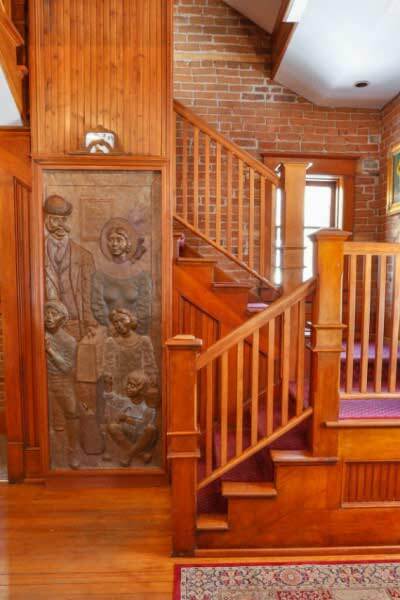 In fact, Lincoln Fox, renowned sculptor, lives locally and created the faux elevator art piece, “The Travelers,” which graces the hotel’s stairs. We are located just one block from Paonia’s main business street, which allows our guests to walk to the many entertainment venues, shopping, theater and restaurants. 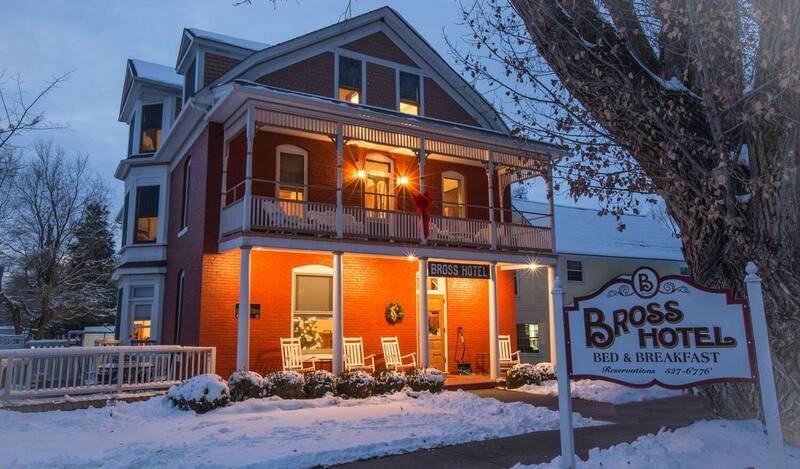 We look forward to you choosing to make the Bross Hotel Bed & Breakfast your Colorado vacation home. 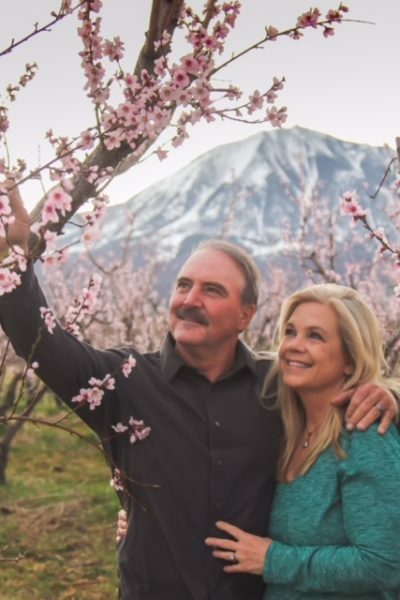 Experience true Western hospitality while discovering this hidden gem and come experience the “Paonia Charm” at the Bross Hotel Bed & Breakfast! There is lovely antique furniture in each room – bedrooms, the lobby, lounge and dining room; you are surrounded by history at every turn. The “elevator,” which is actually an artwork rather than a functioning lift, is so handsome that you don’t even mind taking the stairs to see the panels at each floor. Nancy E.
Welcome to the Bross Hotel Bed & Breakfast! We are excited to share with you our cozy historic hotel and beautiful valley where you can either relax or adventure to your heart’s content! If you have any questions, please don’t hesitate to reach out to us. We look forward to welcoming you as a guest soon. Throughout the year, the area offers a variety of special events, attractions and festivals. 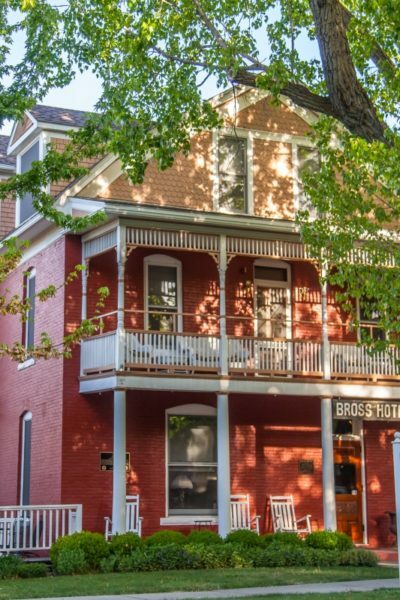 We hope you choose the Bross Hotel Bed & Breakfast as your home away from home during these special times!